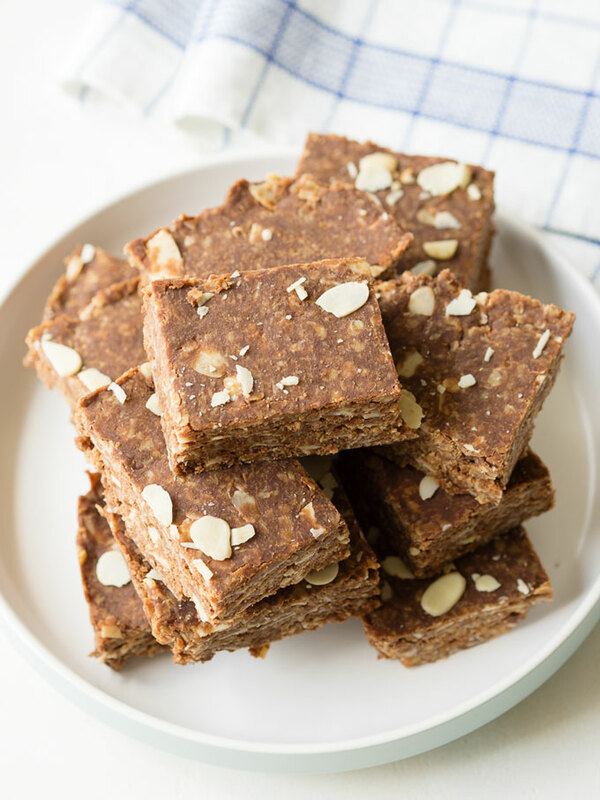 These No Bake Chocolate Oat Bars will give you a big dose of peanut butter, oats, and almonds, for an energy packed breakfast bar recipe. 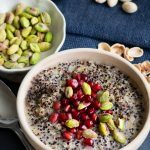 It’s a quick and simple recipe that you can make the night before, so you have them ready to go for breakfast. 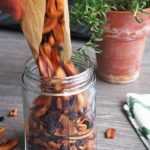 You get a protein-punch from the really really big handful of sliced almonds that goes in it. But if I were to include all those features in the name of this recipe, that would be a mouthful to say. 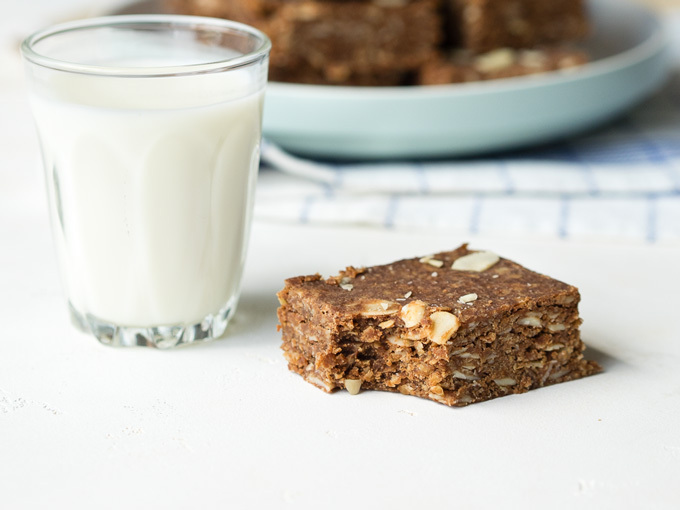 So let’s just call this recipe No Bake Chocolate Oat Bars and save the big mouthfuls for when you actually bite into one of these breakfast bars. This recipe is inspired by No Bake Chocolate Oatmeal Cookies. You know, those cookies that are sometimes called Preacher Cookies? (I think they got that name because before phones or text messages, you might not get a warning that the preacher is about to show up. And if he does, one would whip up a super quick batch of No Bake Chocolate Oatmeal Cookies to share). 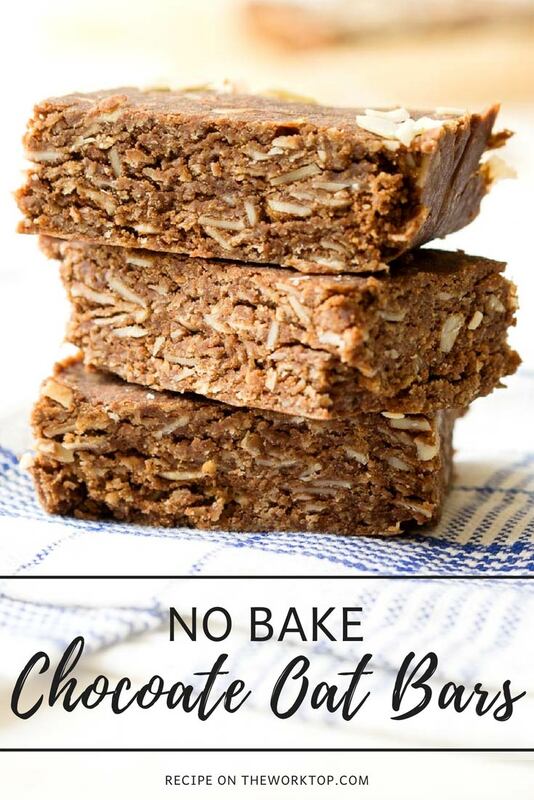 But it’s important that I tell you this No Bake Chocolate Oat Bar recipe is a big tweak from an old-fashioned no bake cookie recipe. This isn’t one of those healthy breakfast bar recipes that taste like cardboard – it really is a treat like a cookie. But unlike a cookie recipe, I cut out a lot of the sugar, and added a lot of almonds into the recipe. 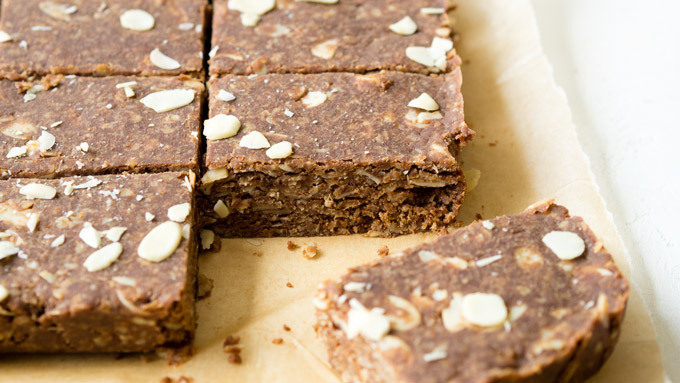 So in the end, you get a big dose of peanut butter, oats, and almonds in this breakfast bar recipe. All that should give you enough energy to power you through the morning. 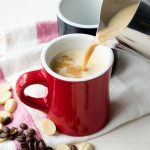 This breakfast bar recipe is quite simple to make, but there are a few pointers I want to leave with you. Most importantly, don’t over boil the sugar mixture. If you have a sugar or instant-read thermometer, you can use it with this recipe. Boil the sugar mixture until it just reaches 230°F/110°C. Otherwise, time it and boil it for about 60-90 seconds. If you over boil the mixture, the breakfast bar will become too dry and crumbly. Maybe you can tell, but the No Bake Chocolate Oat Bars in the photos are just at the cusp of being too crumbly. I was too engrossed with reading my thermometer and trying to take a picture of the process that I missed taking the pot off at the right time. If you focus on cooking the sugar mixture, then it shouldn’t happen to your batch of breakfast bars. One other note, I left the No Bake Chocolate Oat Bars pretty large in the photos, but I find that portion wise, I prefer to cut them even smaller. These peanut butter oatmeal bars are particularly great with a hot cup of coffee, or a cool glass of milk. They are also super handy to pack up and take with you on your morning commute. The slices that don’t get gobbled up at breakfast are delicious as a snack. Store them in an airtight container, and if the weather is hot, you may want to pop that container in the refrigerator…or just devour them all right away! 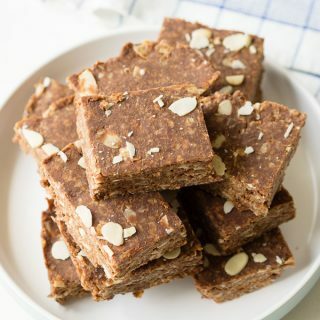 These No Bake Chocolate Oat Bars will give you a big dose of peanut butter, oats, and almonds, for an energy packed breakfast bar recipe. 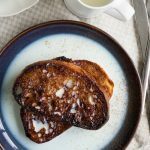 It's a quick and simple recipe that you can make the night before, so you have them ready to go for breakfast. In a medium saucepan, whisk together the sugar and cocoa powder to break apart any large lumps of cocoa powder. Add in the milk and butter and cook over medium-high heat. Bring it to a rolling boil (it should take about 3 minutes). Allow to boil for another 90 seconds. It will be bubbly and frothy. Remove from heat. Stir in the peanut butter, dark chocolate chips, vanilla extract, and salt until smooth. Slowly mix in the oats and sliced almonds. Line an 8x8-inch pan with parchment paper. Carefully dump in the mixture (it will be hot). Cover your fingers with a sheet of parchment paper and gently press down until the top is smooth, being careful because the batter will still be hot. Set aside and allow to cool for approximately 45 minutes. 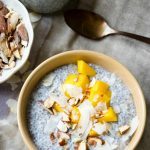 You can speed up the cooling time by setting it in the refrigerator, but it works best cooling at room temperature because then the oats have enough time to soften. 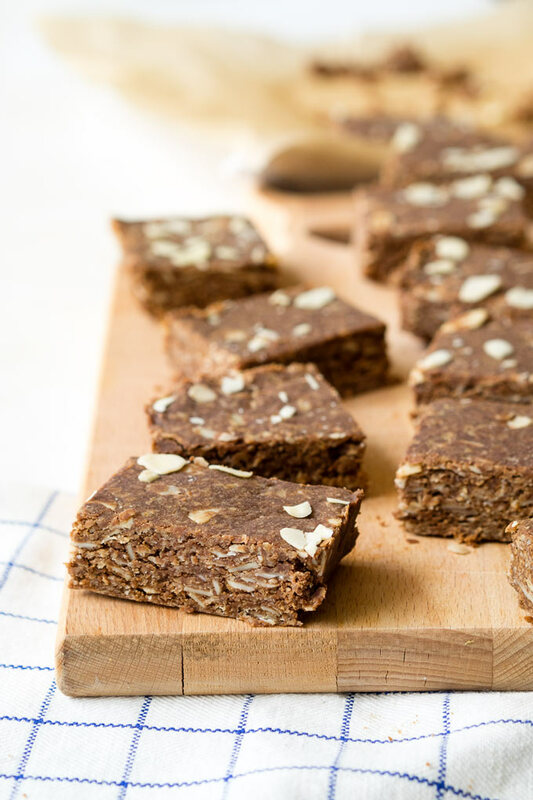 Once cooled, remove the no bake chocolate oat bars and cut into pieces on a cutting board. Store in a airtight container. You should be able to leave these at room temperature, but if it is very hot weather, I tend to keep them in the refrigerator. If you find that bars are too crumbly, it is likely caused by over boiling the sugar mixture. Reduce the boiling time next time. The bars in the photo were boiled for about 3 minutes to 231°F / 111°C. They are slightly too crumbly, and I have found that only boiling the sugar mixture for about 90 seconds works best, and no higher than 230°F / 110° C. You can make this recipe without a thermometer, but you may find an instant read thermometer helpful. 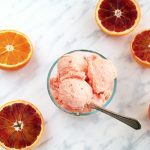 Tried this recipe?If you loved making this recipe I would appreciate it so much if you would give this recipe a star review! I’d love to see it too – snap a picture of your finished dish and share it with me on Instagram using #theworktop and tagging me @theworktop.